RIO DE JANEIRO, BRAZIL – Held in Odeon Petrobras, in Cinelandia, the gala award ceremony for Premiere Brasil, the competitive section of Festival do Rio, brought the 14th edition of the Rio International Film Festival to an end on Thursday, October 11, 2012. 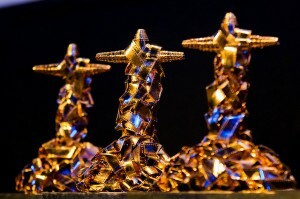 Redentor statues awarded to Premiere Brasil winners, photo by Festival do Rio. Director Kleber Mendonca Filho’s debut film “O Som Ao Redor” (“Neighboring Sounds”) won best fiction feature and best screenplay in the juried section while best feature length documentary went to Cesar Oiticica Filho’s “Hélio Oiticica”. The best director went to Eryk Rocha for his film “Jards” and best actor to Otavio Muller for his role in “O Gorila” (“The Gorilla”). Leandra Leal won best actress for her performance in GreenGo Films‘ “Eden”. Marcus Vinicius Vasconcelos’ “Realejo” took home the prize for best short film, a thirteen minute animation produced in São Paulo. The jury was composed of producers Lucy Barreto and Marcos Prado, cinematographer Renato Falcao, and MOMA Museum of Cinema director, Rajendra Roy. The audience vote, Voto Popular, chose “A Busca” (“Father’s Child”) as best fiction feature film with “Dossie Jango” (“Jango Report”), a documentary about the death of former Brazilian President Joao Goulart receiving the win for public audience best documentary. “Zefiro Explicto” was awarded best public audience short. Organizers report that this year’s festival saw over 280,000 attendees to 427 movies that played in over thirty venues which included various theaters throughout the city and Copacabana beach screenings. Now 36 films will continue showing at Odeon Petrobras until October 18th for those who missed them during the festival.